Delicious coffee has never been easier! With the switch of a button, coffee starts brewing into the reinforced glass Duralife™ carafe and stays ready-to-drink thanks to the "keep hot" carafe plate. The removable filter basket makes for simple cleanup. The DuraLife carafe is long lasting with water level markings that eliminates measuring for hassle free coffee. The sturdy handle and reinforced glass provide for maximum durability. The removable filter basket allows you to clean the carafe periodically between uses to keep the taste of your coffee its freshest and extend the life of your coffee maker. Optimal brewing temperature is ensured with the signature heating elements, giving your coffee optimal brewing temperature providing you with better flavor extraction for your best tasting coffee. This is all controlled with an easy switch on the side of the machine. 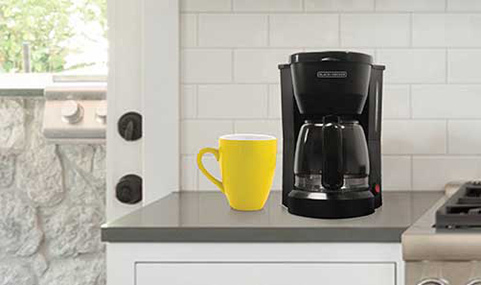 5-Cup* Compact Switch Coffeemaker, Black is rated 2.5 out of 5 by 61. Rated 3 out of 5 by Spudturner37 from Limited lifespan I’ve used this for about 4 years. Halfway, through brewing my last pot, the coffee maker stopped working. The switch still illuminates when turned on, but it will not heat the water, and the hot plate stays cool to the touch. Rated 3 out of 5 by Mike Walz from Replacement carafe My coffee maker (model DCM 600W) works fine and is very appropriate for the amount of coffee I need each morning. However, the carafe broke and I am in need of a replacement. How do I go about obtaining one? Rated 3 out of 5 by YDiane from Handy but carafe needs tender care We bought this during the boxing week but found that there is a crack in the carafe. It is broken within a month and have to find a replacement. Other than that, it is worth. How to order a replacement carafe ? Rated 4 out of 5 by Brittney from My carafe broke!!!! Great machine perfect for my office!My carafe broke. How can I order a replacement? Rated 5 out of 5 by Mabts from Perfect size! I bought this coffee pot over a year ago to have on my desk at work. It's the perfect size and I have had no issues with it whatsoever and I use it every single day. I did break the carafe yesterday though and I am in the same boat that I'm unable to find a replacement carafe online for Black and Decker that is the right size for this pot. I see other people have had this issue as well. Help, I need my little coffee pot back to make it through my day at work! Rated 5 out of 5 by Jefa from need a new carafe Love this little coffee maker - perfect for two coffee drinkers. Our carafe broke. How can I order a replacement? Rated 1 out of 5 by caffeineislife from No replacement carafe The machine worked fine for the daily usage over the years I've had it, but the carafe fell and shattered. I cannot find a replacement, so now I have a useless appliance that still works. I'll go back to using my French Press - it may take a few more minutes, but at least if it breaks, I'm not throwing out something that still works.Regardless of price of the original item, a company should support the reduction of waste, especially of plastics. By not providing replacement carafes for the 5-cup coffee maker, B & D is creating pollution and is not a good steward of the Earth's resources. To reduce waste, I would have happily bought a replacement, even if nearly the price of a completely new appliance, but not given the option, B & D has forced me to contribute to the growing problem of what to do with plastic, non-degradable waste in our landfills. new coffee pot. coffee continues to pour when pot is removed. is there supposed to be a stop in basket.